The Stone Angel by Margaret Laurence is not a novel for the faint of heart and nor is it one that will leave you feeling comfortably satisfied. In fact, it's profoundly disturbing but not in any overt way. As in life, it's the subtleties of each action or inaction that creates the final picture. Such is the case with Hagar Shipley, an elderly woman at the end of her life who, when looking back over more than ninety years, finds no joy. She is not sure if she has ever experienced love. The Stone Angel is part of the reading curriculum in many high schools at the grade twelve level. Perhaps by reading it early in life, it can serve as a cautionary tale. Laurence does not relent. The character's conviction carries Hagar from her rather forbidding Scottish father's home to a less than reasonable marriage where she repeats mistakes and favours one son over another. She has shared nothing of herself with anyone in her life, including her children. Her rigid sense of morality and what constitutes acceptable behaviour results in outward appearances that are at odds with the twisted and withered state of the soul and its ability to feel and to give. Add to this, Laurence's uncanny ability to cut to the heart of the matter with grace and grit and you have a novel that can't be ignored. Hagar's pride is her undoing and throughout the novel there are instances that provoke, illuminate and endear despite their connotations. It's perhaps the honesty that draws us close to a personality that is intent on solitude and bitter in old age. Hagar about her husband, Bram: "Whatever anyone said of him, no one could deny he was a good looking man … I could have been proud, going to town or church with him, if only he'd never opened his mouth". Her thoughts on a visit from her daughter-in-law's minister: "I sit uncomfortably. I am bloated, full, weighted down, and I fear I may pass wind. Nevertheless, for the minister's call I have at least put on my gray flowered dress…and the flowers, sprinkled liberally, almost overcome the gray". As for the stone angel, it had always perplexed her. Hagar peers into the distance from the train on her way back to Manawaka and sees the angel "sightlessly guarding the gardens of snow, the empty places and the deep-lying dead". Don't expect a formula story wrapped up tidily at the end in ribbons of moral correctness. Nor will there be any predictable radiant outcomes involving forgiveness and group hugs. Instead, Laurence paints a vivid picture of characters true to their time and their convictions. Hagar in a moment of clarity: "Hard to imagine a world and I not in it. Will everything stop when I do? Stupid old baggage, who do you think you are? Hagar. There's no one else like me in this world". Is is possible to resolve a life lived joylessly? Perhaps it is. The Stone Angel is honest, uncomfortable, uncompromising, endearing and brilliant! 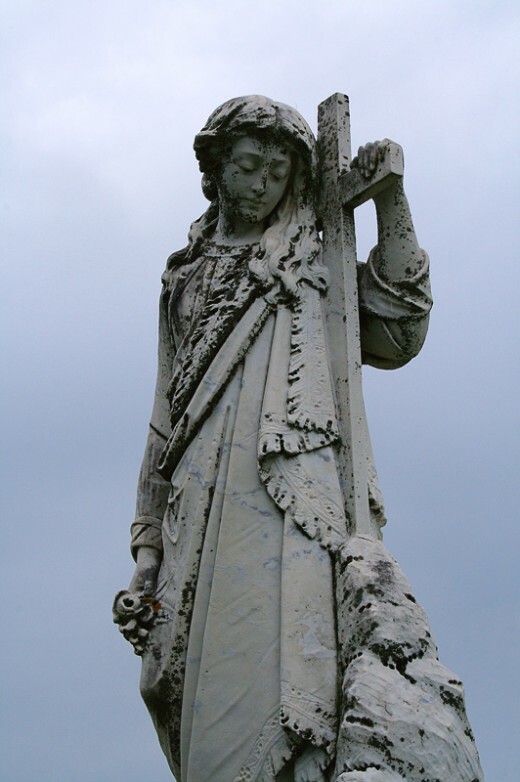 In 2007, The Stone Angel was made into a film with Ellen Burstyn in the starring role as Hagar. With a screenplay by Kari Skogland (50 Dead Men Walking) and based on the award winning novel of the same name by Margaret Laurence, The Stone Angel explores a rather unconventional and troubled life through the reminiscences of a woman nearing ninety.